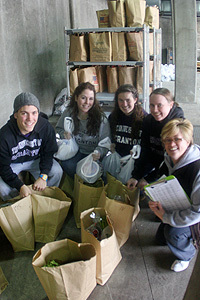 In the 2010-2011 academic year, about 3,030 University of Scranton students contributed more than 175,000 hours of volunteer service through local, domestic and international service programs and service learning. In addition, faculty and staff are involved in hundreds of community service and volunteer programs that have a positive impact on the region and the City of Scranton. The University’s commitment to service flows from its Jesuit mission to educate men and women for others in a manner where concern for social problems and the promotion of justice are always present. Community Based Learning: Throughout the academic year, students participate in community activities as part of their course work. In the 2010-2011 academic year, 135 community based learning classes were conducted. 2040 students engaged in academic service learning for a total of 21,420 hours. This included 1355 majors from the Panuska College for Professional Studies, which requires 40 service hours for graduation. Panuska College: All students in the Panuska College for Professional Studies (PCPS) perform community service through coursework and projects as a requirement for graduation. Since 2005, PCPS students have completed more than 78,000 hours of service learning throughout the community. The PCPS commitment to the Ignatian qualities of care for one another and concern for those less fortunate is demonstrated in its rigorous service learning requirement as well as in the Leahy Community Health and Family Center. Leahy Center: The Leahy Center, which includes a Clinic for the Uninsured, is dedicated to the dual purpose of identifying and meeting the health and wellness needs of underserved individuals in the greater Scranton community while providing a place where faculty can guide students in practical educational experience. Since opening in 2007, the Leahy Clinic has provided free health care services to uninsured Lackawanna County residents who may otherwise forgo health care, or seek care inappropriately in hospital emergency rooms. The Clinic operates one evening a week year-round, with 15 physicians and 6 RN’s volunteering on site, and more than 35 physicians providing services off site. In 2010-2011, 135 students contributed 1500 hours; 1200 patients were treated; 500 prescriptions dispensed; and 180 immunizations administered. Student Service: The University coordinates student service in the local community, working directly with 120 Scranton area non-profit agencies, through its Center for Service and Social Justice. Contact the Director of the Center for Service and Social Justice, Patricia Vacarro, at patricia.vaccaro@scranton.edu or (570)-941-7429. Faculty Service & Research: The Office of the Associate Provost for Civic Engagement and Academic Mission coordinates the collaborative development of academic service. For questions and inquiries related to faculty service and research, contact (570)-941-7520. University-Community Connections: To explore and identify mutually beneficial avenues for University-community cooperation or if you have questions generally about the University’s programs and activities in the community, contact the Director of the Office of Community and Government Relations, Julie Schumacher Cohen at julie.cohen@scranton.edu or 570-941-4419.